Given the present, stress-inducing state of the economy and the world, there has never been a better time to provide a wake-up call on how to relax, get centered, get 8 hours of sleep and be happier and more successful. Recent research has shown us that when we get enough sleep, we are able to accomplish more in less time and with less stress and greater health. We don't need a 26-hour day. With more efficient and effective sleep habits, in our book, 24 hours is more than adequate. Our proposition is simple and compelling. Do you want to be healthier, more productive, energetic, creative, organized, efficient, and constantly expanding your potential? Do you want to be less stressed, happier, have a better relationship with yourself and others, and a deeper sense of well-being? What if you could take a few small steps every day that would enable you to eventually achieve all these things? You can. In fact, it's easy. 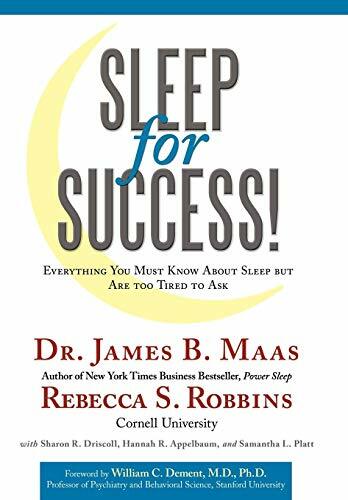 Sleep for Success!, a convincing, psychological approach to changing attitudes and behaviors, is written for anyone who wants to get a great night's sleep, feel wide-awake and be a peak performer all day. It pertains to executives, students, parents, athletes, children and senior citizens. If you're human, chances are that you are at least somewhat sleep deprived. Sleep for Success! can change your life - literally overnight. Dr. James B. Maas received his B.A. from Williams College and his M.A. and Ph.D. from Cornell. He is Stephen H. Weiss Presidential Fellow, professor and past chairman of psychology at Cornell University, and professor at the Weill Cornell Medical College-Qatar. He is the recipient of the American Psychological Association's Distinguished Teaching Award for being the nationAEs outstanding educator in psychology. He is the cofounder of Sleep for Success, a consulting company that provides sleep and performance education to corporations, educational institutions, and professional athletic franchises. He is one of the nationAEs most sought-after speakers, and has presented to major corporations, medical organizations, and sports teams such as the New York Jets and the Orlando Magic. Rebecca Scott Robbins, B.S. Cornell University, served as instructor at the Weill Cornell Medical College-Qatar, is a PhD candidate in communications at Cornell University, and is cofounder of Sleep for Success.